Early morning explosions rocked Baltimore’s Mt. 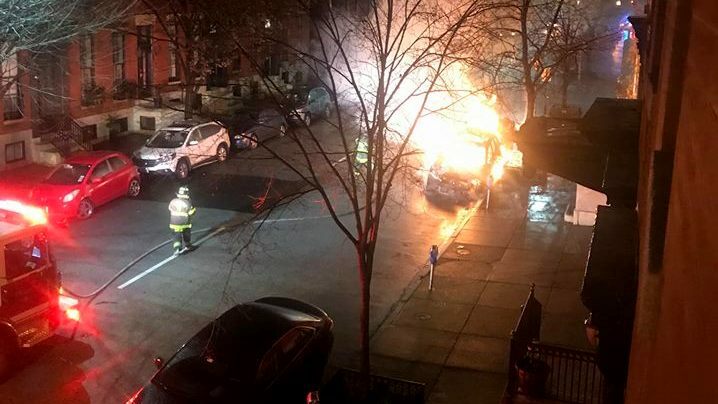 Vernon neighborhood today as multiple cars were set on fire in the area of Charles and Eager streets. “We believe this was a random act of violence,” interim Police Commissioner Gary Tuggle said, speaking to reporters at Baltimore Police headquarters. Tuggle said seven cars were set on fire and that the flames spread to two vehicles. “Collateral damage,” Tuggle called them. For neighborhood residents, the fires and explosions that sent a shower of window glass onto sidewalks at about 3 a.m. turned their relatively quiet neighborhood into something resembling a war zone. Across Baltimore, news of the explosions were one more grim reminder of another violent week in which the city officially passed the 300 homicide benchmark for the fourth year in a row. The 300th victim was a 30-year-old man shot in the face and upper body at about 11:30 p.m. Wednesday in the 1800 block of Baker Street in Sandtown. The bloodshed continued last night in the busy Fells Point bar district when a man was fatally shot just after midnight inside the Blarney Stone Pub in the 700 block of South Broadway. Police said the the fatal shooting took place following an argument by two patrons. THE FIRES AND EXPLOSIONS TURNED A RELATIVELY QUIET NEIGHBORHOOD INTO SOMETHING RESEMBLING A WAR ZONE.